BIOMIMICRY is elements of nature that solve complex human problems. Biomimicry has improved new technologies and inspired biological solutions to modern life. There is a large movement in applying nature’s solutions for architecture, in order to improve eco-friendly living. The biomimicry architecture of the Nautilus, designed by Javier Senosianin’s, snail-shaped dwelling, is an example of what he calls “Bio-Architecture”. Bio-Architecture is based on organic forms that bring us back to local history, traditions and cultural roots, creating harmony with nature. If you see a familiarity with Senosianin and Gaudi, you would be right. A recent post I did about Antoni Gaudi’s work, Le Casa Batlló, which I toured in the heart of Barcelona, has many of the same similarities. This is home to the Mayorga family, built cohesively to its geography and climate, located in Mexico City. It is constructed of a sprayable ceramic called, Grancrete. Grancrete is a sustainable material that is stronger than concrete, fire resistant and provides good insulation in hot and cold climates. This home, due to its spiral shape is earthquake-friendly and needs little maintenance. I think what connects Senosianin and Gaudi as creatives is an artistic experimentation and biomimicry solutions to their environment. The Watercube, designed to host the Beijing Olympics in 2008 was based on the structure of soap bubbles, giving it a natural feel and resistant to earthquakes. 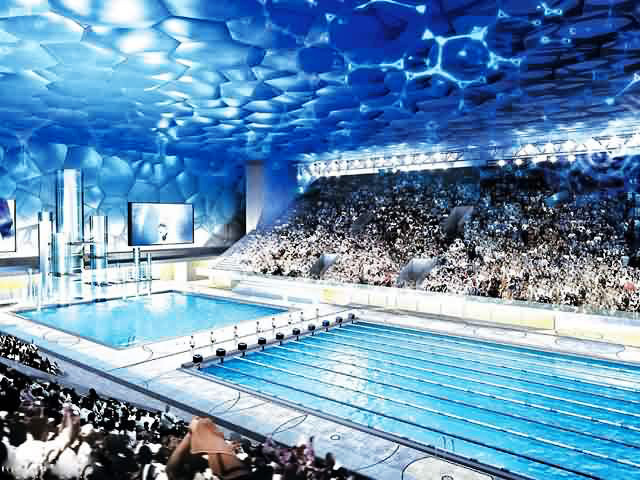 The architecturally constructed bubble design is built to trap hot air from the sun and then circulated it to heat the pools, where the athletes competed. The Aqua Tower, in Chicago, designed by Jeanne Gang, was inspired by the striated limestone outcroppings seen in the Great Lakes. Her focus was sustainability and is demonstrated in the design of the outstretched balconies, by as much as 12 ft., promoting the maximum amount of solar shading. Other sustainable qualities include rainwater collection system and energy-efficient lighting. This modern skyscraper plays well with its environment. I believe nothing in life should be forced, it should cohesively fit well. Biomimicry architecture works well with nature because it learns from nature, a marriage made in heaven!